Already parents to four kids, the Gaines were not expecting another baby to join the family. But life had different plans for the two. On June 21, 2018, they welcomed Baby Crew to the world and people can’t get enough of him! During their interview on NBC’s Today Show, Joanna told the hosts that Baby Crew was truly “a gift” to their family. Seeing someone, as driven as Joanna Gaines, take the time for herself and her family is truly inspiring. And with all her previous experience raising four other kids, she’s definitely a natural with Baby Crew. When asked how the older kids are handling having a new bundle of joy in the house, Chip and Joanna both agreed that the older kids have been a big help. With all that extra help, it makes raising baby number five much easier this time around! When the talk show hosts were invited to hold Baby Crew, they jumped at the opportunity. All smiles, Chip passed off Baby Crew to the ladies as everyone sighed with happiness. And while Crew was definitely one of the highlights of the day, the couple couldn’t help but goof off and talk about what pregnancy was like for Chip. He also made sure Joanna knew he would always be her biggest fan. With all the fun and excitement going on in her life – it is crazy to believe that Joanna has not only started her own business but also stared in the hit HGTV show, Fixer Upper and wrote a book! Years in the making, “Home Body: A Guide To Creating Spaces You Never Want To Leave” lets fans think like Joanna when they are decorating. You can watch their full interview and see all the adorable moments with Baby Crew in the video below. 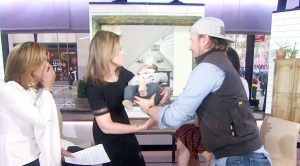 There's no better way to start the day than seeing baby Crew crash Chip and Joanna Gaines' interview!